Recent slow evacuations of monorails have me concerned, despite monorail's amazing safety record. Fire and smoke spread quickly: are we ready? While a monorail fire is an extremely rare event, it still has the potential to be disastrous. Lives can be lost if swift evacuation is not possible. By far the quickest evacuation for a monorail train is with use of an emergency walkway next to the train at all points along the guideway, yet not all monorails have them. Reasons for not including walkways run the gamut from expense, aesthetics to the argument that such an event is extremely rare and therefore they're uneeded. I personally prefer the clean aesthetics of monorail track without walkways, especially where portions of the track are singular (near stations and switches). That said, I realize that swift evacuation is something that all transit should be capable of. 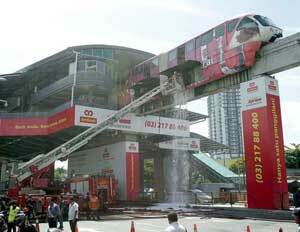 As the Daegu Monorail has demonstrated (photo above), there are several methods to deal with fire without walkways. Each Daegu train features 'Spiral Shooter' escape slides. Fire suppression takes place with an on board water sprinkler system. Daegu even has a fire-fighting helicopter ready to act if needed. I won't get into the walkway or no walkway debate here, however I do want to stress the importance of fast, safe evacuation, no matter how it's achieved. Again, monorail fires are rare. However, the following moments in monorail history dramatically demonstrate the need to be ready for any such event. The Hemisfair mini-monorail was more novelty than transport, yet its troubled history is well-known. Besides a tragic collision/derailment accident in which several people were injured and one elderly woman died, another incident involved a fire. While there were no injuries, the results shown in this photo are certainly alarming. Consider the possibilities of such a fire in a full-sized transit monorail. 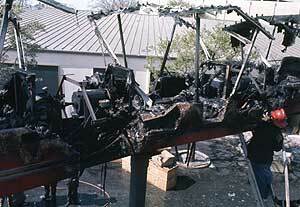 On June 26, 1985, a fire engulfed the rear car of the Mark IV Silver monorail train on the Epcot beam. On their own volition, passengers in the burning car broke out windows and climbed to the roof of the train to get away from the fire. Two of the passengers were reportedly off duty fire rescue men, who knew that dramatic and quick action was needed for survival. Seven passengers were hospitalized for smoke inhalation and other relatively minor injuries. As was noted at the time, it could have been a lot worse. One witness remarked how she was amazed that everyone survived. Quickly after the fire Walt Disney World Resort established on-board fire detection systems, emergency roof exits, roof hand rails and extensive evacuation planning. A flat foam-filled guide tire was determined to be the cause of Silver's fire, heated by the friction by being dragged along the beam. Tires are now filled with nitrogen instead of air. 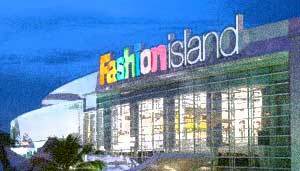 On February 26, 2002, a fire broke out on a small amusement park monorail in Bangkok's Fashion Island shopping mall, tragically killing two young girls, aged 6 and 8. A short-circuit caused the fire. Two other children were injured when they fell out of their car, while several others riding the train escaped unharmed. The flames prevented the two girls from being rescued, and they died before the fire was extinguished. Police investigators found that the ride had no circuit breaker installed, nor was there any fire-proof insulation between the compartments and the motor. The monorail was subsequently removed. On May 31, 2004, passengers were evacuated from Seattle Monorail's blue train. The train caught fire with 150 people aboard as it departed from the Seattle Center Terminal. The train stopped on a banked curve just outside of the tunnel formed by the Experience Music Project (EMP) building on 5th Avenue. Flames shot out six to eight feet from the rear of the train. The driver directed frightened passengers to move to the front of the car and the doors were then opened. Black smoke billowed out as the fire department arrived. Passengers gathered by the open doors to get fresh air while waiting. Firefighters used a ladder to evacuate passengers. The red train parked alongside the blue train and began evacuating other passengers onto it via metal planks connecting the two trains. Most passengers escaped via the fire truck ladders positioned at doors of both trains, climbing down about 25 feet to the street. About 50 passengers rode the red train back to the Seattle Center Terminal. Forty people were treated at the scene and released. Eight passengers and one firefighter were taken to a hospital and treated for smoke inhalation. Seattle Monorail Services, a private company that manages, operates, and maintains the 1962 Alweg Monorail system under a profit-sharing contract with the City, hired an independent team to investigate the fire. It was the first train fire in the then 42-year history of the monorail. The monorail has since received extensive modifications with the addition of modern electronics, as well as a hot body detection system. 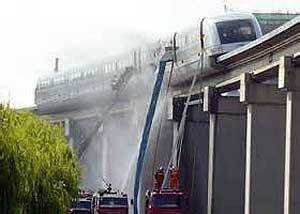 On August 11, 2006, a Shanghai maglev monorail train caught fire and halted between stations. Passengers were evacuated immediately without injury. Both ladders and an escape slide were used for evacuation. The fire was extinguished within an hour. An electrical problem was said to have been the cause. 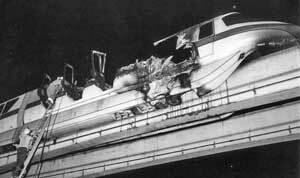 Thirty years after the frightening near-casualty fire of Walt Disney World, KL Monorail suffered a similar tire fire at Titiwangsa Station. According to one witness, KL Monorail employees were not properly trained to manage the crisis. No announcements were made and evacuation was self-initiated by passengers in the station. What happens if this fire took place between stations with a full load of passengers? Non-fire related evacuations are also a concern. 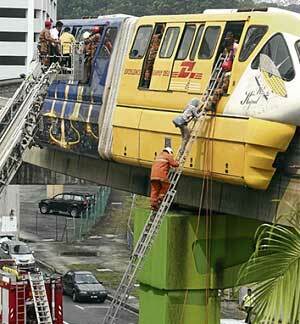 The photo to the right shows a Kuala Lumpur Monorail incident in 2012 in which a stranded train was evacuated. While evacuation was done as quickly and safely as possible, some passengers still had enough time to become panicky while waiting in the crowded two-car train. After 15 minutes it became unbearably hot since there was no air conditioning. A passenger broke a window out for ventilation. 63 passengers came down the fire ladder, which you can imagine is a slow and scary process. The other 120 passengers were side-by-side transferred to a rescue train and were transported to a nearby station. The evacuation process took around an hour. As the above-listed incidents have shown, fire and smoke will not wait an hour to spread! With more and more monorails coming online, it is possible that glitches and mishaps will increase, as they do with any technology. I urge monorail operators and manufacturers to continue to strive to improve quick ways to evacuate passengers safely. I also recommend frequent practice of emergency evacuations, something that is already the standard for many monorail operators. It's what is right for the safety of passengers, and it's also what's right for the industry. 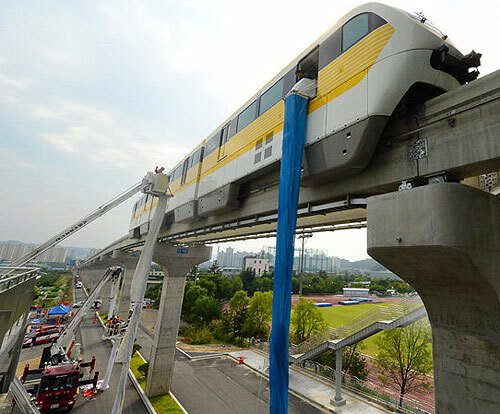 We all know the many benefits of monorail, but one disaster could have a devasting effect.